The Labor Force Participation Rate is lower than the rate during the Great Recession for all age groups except those 55 years and older. The percentage of women attached to the labor force continues to decline. Non-farm payroll three-month average is the lowest of the year and lower than last year. Reposted with permission from Smaulgld. In February of this year, we noted that the job recovery was a farce. We reviewed the job market through the lens of the overall labor force participation rate and that rate by age group. Last week, the U.S. Bureau of Labor Statistics released its non-farm payroll (NFP) report for October. The report showed 271,000 new jobs created surpassing expectations by about 90,000. The unemployment rate was reported to be at just 5 percent. The unemployment rate was reported to be at just 5 percent. The mainstream financial media and wall street traders (and algos) only look at the headline NFP and unemployment numbers, rather than also looking at what type of jobs were supposedly created and who got or lost them. Many criticize the NFP report because it is not a measure of actual jobs created but rather relies on a survey that uses assumptions that some believe are faulty (the numbers are based on birth and death assumptions with no proof that any jobs were actually created). This leads to charges that the NFP numbers can easily be manipulated. The unemployment rate is also criticized for how it is calculated. If one is not considered in the labor force, the Bureau of Labor Statistics does not include them as “unemployed.” Therefore, if the labor force participation rate drops, the unemployment rate can also drop. The analysis below assumes that even if the NFP numbers are extremely accurate, the job market is still poor. The August and September NFP numbers were low and only revised slightly higher in the October NFP report. The three-month average NFP reports covering August through October 2015 is about 187,000 new jobs created — lower than any three-month period of this year and lower than the comparable three month period of past year. The labor force participation rate identifies those people who have jobs as a percentage of the population. Since February of 2015, when we last examined the state of the jobs market, the labor force participation rate has not improved, despite the robust job reports. 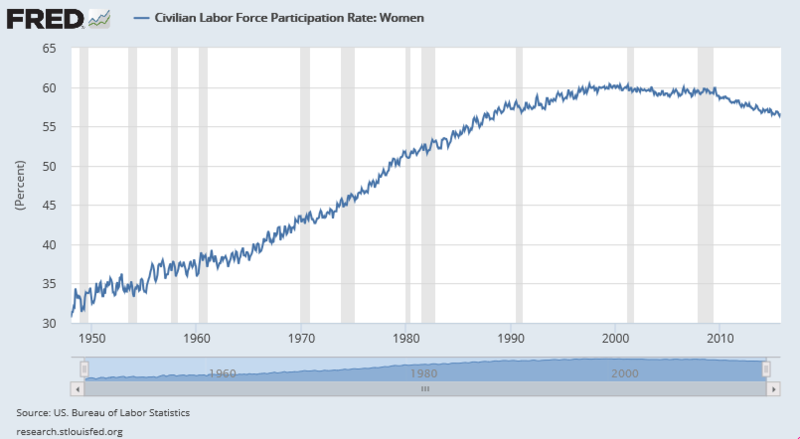 The general labor force participation rate in October 2015 was unchanged from February 2015 and at levels last seen in 1978 — when women had not fully entered the labor force. The persistently low labor force participation rate is not a function of retiring baby boomers leaving the labor force. (see the rising labor force participation rates of those 55+ years and older and 65+ years and older below). Source: US. Bureau of Labor Statistics, Civilian Labor Force Participation Rate [LNU01300000], retrieved from FRED, Federal Reserve Bank of St. Louis, November 6, 2015. Slightly less than one-third of those aged 16-19 were working in October 2015. In 2000, more than 50 percent of those aged 16-19 were attached to the labor force. In October 2015, the percentage of those aged 16-19 attached to the labor force declined to levels lower than those at the height of the Great Recession. In the summer of 1978, nearly three-quarters of those aged 16-19 were working. Source: US. Bureau of Labor Statistics, Civilian Labor Force Participation Rate: 16 to 19 years [LNU01300012], retrieved from FRED, Federal Reserve Bank of St. Louis, November 6, 2015. The labor force participation rate among 20- to 24-year-olds (college student and graduate age) remains lower than at any point during the Great Recession. Source: US. 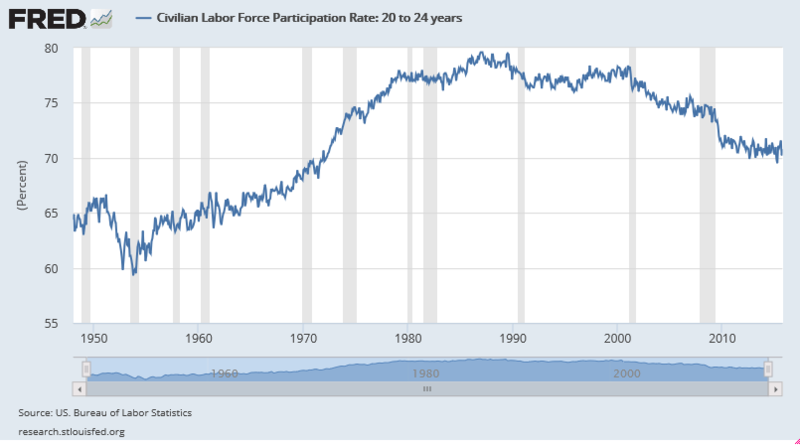 Bureau of Labor Statistics, Civilian Labor Force Participation Rate: 20 to 24 years [LNS11300036], retrieved from FRED, Federal Reserve Bank of St. Louis November 6, 2015. October 80.9 percent, February 80.9 percent. May 1978 76.7 percent, March 2000 84.5 percent. In a robust economy and job market one would expect the labor force participation rate among 25- to 54-year-olds to be increasing. The percentage of those in their prime earning years, however, has remained flat all year and lower than at any time during the Great Recession. Source: US. Bureau of Labor Statistics, Civilian Labor Force Participation Rate: 25 to 54 years [LNU01300060], retrieved from FRED, Federal Reserve Bank of St. Louis, November 6, 2015. 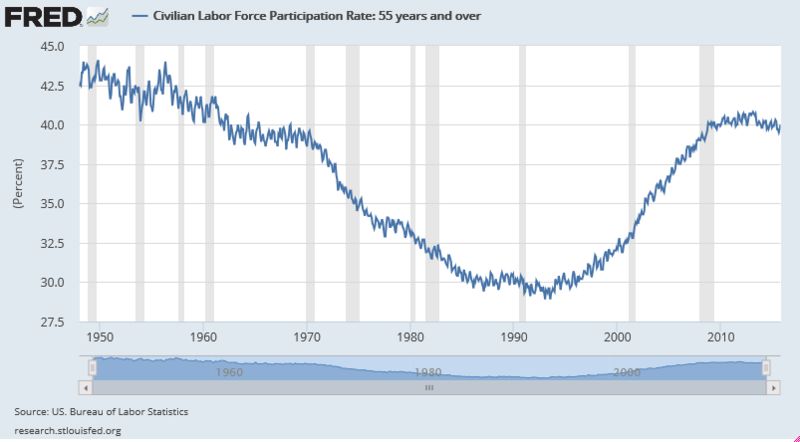 One oft cited rationale for the declining overall labor participation rate and one that Fed Chair Janet Yellen subscribes to is that as baby boomers retire, there predictably are fewer people as a percentage attached to the labor force. The U.S. Bureau of Labor Statistics data directly contradicts this assertion. 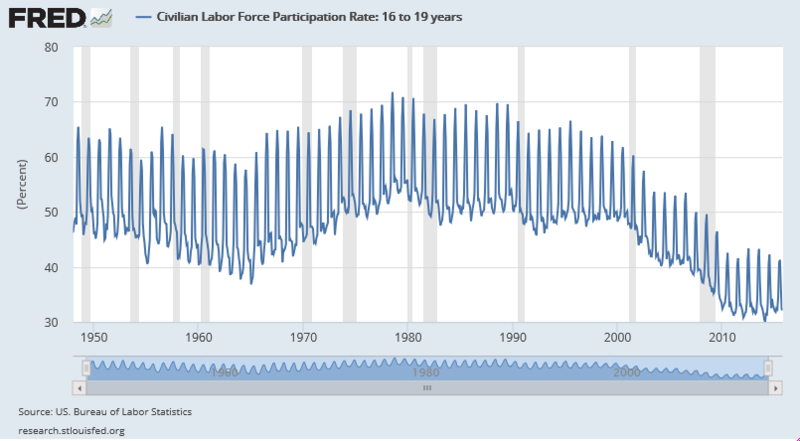 As we have seen above, there have been declines in the percentages of each of the 16- to 19-year-old, 20- to 24-year-old and 25- to 54-year-old labor force participation rates since the Great Recession. If the theory that retiring baby boomers are contributing to a lower overall labor force participation rate, then we would expect an even steeper decline in the labor force participation rate among baby boomers. Rather, the labor force participation rate among those 55 years and older is increasing. Baby boomers are staying employed longer or coming out of retirement to work because they either have insufficient retirement savings or can not make ends meet on their retirement savings as there is no longer any meaningful interest paid on bank deposits and certificates due to the Federal Reserve’s zero interest policy the past six years. Early retirement for those age 55 and older peaked in the early 1990s. Souce: US. Bureau of Labor Statistics, Civilian Labor Force Participation Rate: 55 years and over [LNU01324230], retrieved from FRED, Federal Reserve Bank of St. Louis, November 6, 2015. 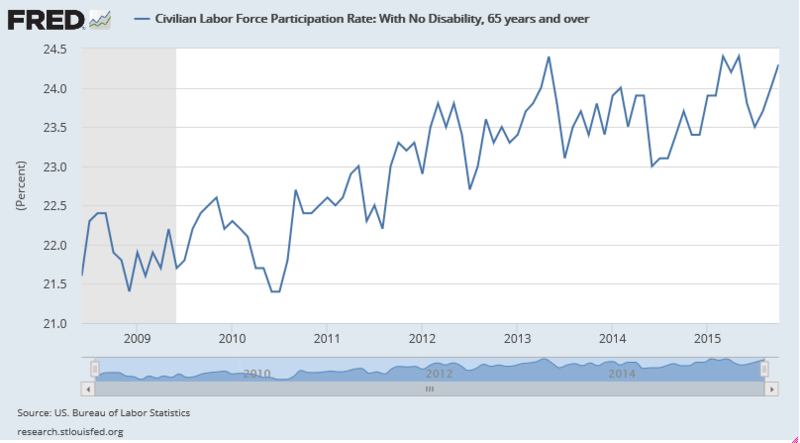 Strong growth in the labor force participation rate among those 65 years and older has been a hallmark of the period since the Great Recession. The oldest baby boomers (those 65+ years and older) have experienced the greatest increase in labor force participation rate of any age group. Source: US. Bureau of Labor Statistics, Civilian Labor Force Participation Rate: With No Disability, 65 years and over [LNU01375379], retrieved from FRED, Federal Reserve Bank of St. Louis, November 8, 2015. The labor force participation among women has declined sharply since the end of the Great Recession. Source: US. Bureau of Labor Statistics, Civilian Labor Force Participation Rate: Women [LNU01300002], retrieved from FRED, Federal Reserve Bank of St. Louis, November 6, 2015. The Fed desperately wants to raise rates to validate that their multiyear multi-trillion dollar quantitative program and zero interest rate policy worked. Irrespective of any analysis of the labor force participation rates, the Fed can point to the sturdy non-farm payroll numbers as validation that their policies have worked. The Fed needs to raise interest rates to gain that confirmatory credibility and to combat de-dollarization initiatives by the BRICS nations and the continued rise of the Chinese Yuan as an international currency. Raising rates also gives the Fed the leeway to lower rates as the economy decelerates. Having gained some credibiity in raising rates, the Fed can eventually institute a negative interest rates, embark on another round of quantitative easing and help usher in a cashless society where they will have even greater control over monetary policy and the economy. All made possible due to a “blowout” jobs report.